FROM DULL CEILING TO BEAUTIFUL CEILING IN JUST A FEW HOURS. Remodeling the Ceiling is a Great Place to start a Do It Yourself “DIY” project for either Business or Residential Décor. 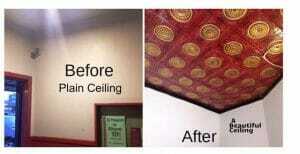 Pictures are a great way to see what Before, During and After can do to change the appearance of a Ceiling. Easy DIY Project just select Ceiling Tile and Color, measure, cut & glue up with overlapping edges eliminating Ceiling Tile seams. 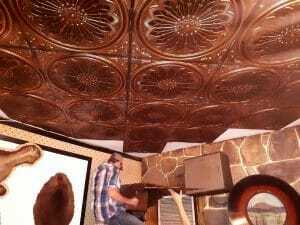 At Hotel “98” Ceiling Tile Design 238 Antique Gold Installed. HOTEL 98, Whitehorse, Yukon, Canada. Pictures & Video Before, During & After. Unfortunately, the historic Hotel “98” is not listed as an attraction in the Yukon and Whitehorse tourist guides. Yet a visitor to Whitehorse who does not visit the 98 Hotel misses experiencing a venue unchanged over the past 60 years. But Times are a changing, see the Beautiful Ceilings Created using Ceiling Tiles from Ceiling Tiles By Us. The mirrored bar has rifles and shotguns above it. One used to be loaded just in case! The walls have animal pelts, and pictures of Can-Can Girl competitors over the past half-decade. On Tuesday nights, a fiddler entertains. The Hotel “98” now hosts a Breakfast Club in the mornings. A mug of hot chocolate was only a dollar. Mornings are a good time for the more faint-hearted to visit the “98”. Experience a taste of Whitehorse, Yukon, Canadian Hospitality at Hotel “98”! The historic Hotel “98” is a great place to mingle with the locals, have a Great Time & Unwind. Some Patrons say “Cheap Drinks, Classy People, Live Music on Thursdays, a friendly classic northern destination. For Information contact Eva Stehlin, owner, Hotel “98” located at 110 Wood Street, Whitehorse, Yukon, Canada call 867-667-2641.